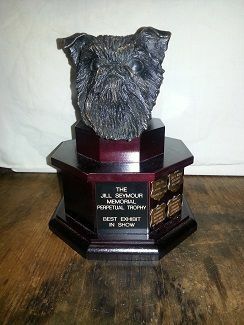 I had a marvellous time judging some beautiful Griffons at your Club Specialty. I was really eager to see some dogs and lines that I had never seen in person. I was not disappointed at all. Overall it was a lovely entry; many with excellent breed type. Heads in general were quite nice. General issues were lack of properly domed fore face/strong stops. Overall expression was good in most entries. I am one for very strong substance and bone in Griffons (as I am sure you noticed from the winners) and I thought there was room for improvement here in some. That said, I was impressed with the overall top lines, tail sets and outlines. Do keep an eye on the length of your Griffons though as they must be square to have proper breed type. The great majority of the dogs had excellent temperaments. Movement in general was more than adequate which is impressive for a toy breed. I was more than happy with the quality of the dogs. Congratulations to the committee and club members for putting on such a top flight specialty. I was truly honoured to be part of your 40th anniversary show. Thank you for inviting me and showing me such great hospitality. Keep up the good work; you are doing a great job. Smooth red dog with a very nice top line, beautiful tail set. Very good rear moving away. Lovely happy temperament. Very nice substantial body for his age. Very nice large round eye, with good skull and nice under jaw. Good expression, where smaller ears would have made it even better. Rough red dog with a beautiful eye and nice expression. He had a good top-line, but with a bit squarely tail. He had a good coat with good color and a rather nice moving young dog. Red smooth that was a very pleasing size. He had a very good proportion with good substance for his age. He had a very good tail set and carriage. Wonderful fore-chest and front structure. Pleasing head with nice round eye, good domed stop, and nice ear set, although the ears could have been a bit smaller. He had good rear movement. This puppy had a good top line and good substance for his age. He had a nice round eye. His stop was a bit shallow. He had a very good coat and was presented very well. Red rough having a nice level top line that he held nicely while on the move. This puppy had good depth of body and nicely developing fore-chest. He had a nice large nose and round eye, with decent under jaw. His coat was bit thin and hopefully will improve with continued work.